Gallifrey is in trouble. The Knights of Velyshaa are about to invade. They've better weapons than the Time Lords. Vansell, a Celestial Intervention Agency operative, has arrived to warn them. But he might be too late. And somewhere, somewhen the Doctor is involved. Yes, it's the Three Doctors again. Except this time it's the Fifth, Sixth and Seventh and this time they're on audio. Welcome to the first ever Big Finish release from all the way back in 1999. When men were men etc. Unusually for a multi-Doctor story it takes three episodes for the Doctors to come together. Each has an individual adventure and his own problems to deal with first whilst in the background (and indeed foreground) The Doctor is being manipulated. The problem with 'The Sirens of Time' is that it doesn't quite know when to stop piling enemies in. There's a kind of desire to build to some kind of ultimate threatgasm that means just as we think we know what we're up against up pops another possibly bigger threat. Or is it just a bluff? Or double-bluff? Or just a load of nonsense. In a sense it doesn't matter a jot. Like all multi-Doctor stories (well, almost all) the plot is irrelevant to the fun of getting them all together. Surprisingly, especially considering the Sixth Doctor's involvement, the Doctor's are generally civilised to each other. There's a little mocking but in the end the scale of the threat, the mess that they're in and the rather terrible realisation that they might just have meddled a little too much keeps them on good behaviour. It's nice to hear all the old Doctors again. Davison is the only one of the three that sounds drastically different. He's vocally aged and it helps actually. He sounds wearier, which almost suits the Fifth Doctor. 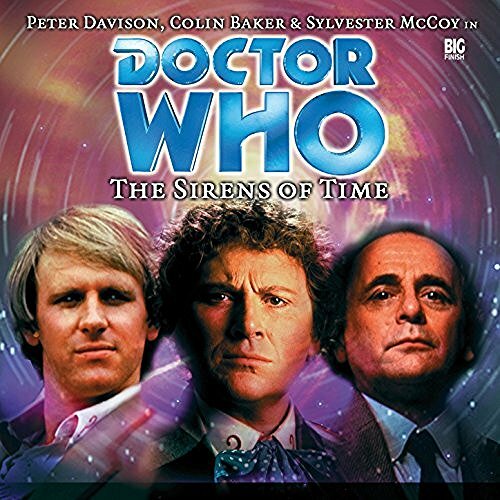 Colin Baker is on fine form as the Sixth Doctor. As fresh as a daisy and relishing getting another chance at being the Doctor. He's got a point to prove and it shows. Finally Sylvester McCoy is also little changed. His Doctor seems a little more thoughtful but it is his initial adventure that kick starts the events of this tale. As I said it isn't the best Doctor Who story ever but it does a job. It reminds us of each of the Doctors, re-introducing some of the greatest hits and foibles. It gives each of them a moment in the sun without any of them being over or under used. Whilst I love Doctor Who in its original home, television; I think Big Finish have done an admirable job of keeping the Classic Series alive & kicking on audio. If you've never listened then you should do so. Hopefully these articles will encourage you to stick a toe into the waters. You can't go wrong starting here but there is much more to come. I'd snap 'em up if I were you.